Dodge the Kiss Cam at a Dallas Stars game. Put on your game face for these excursions. Dallas is a sports-centric city, and we have five professional teams to prove it. From bars plastered wall to wall with high-definition televisions to Cowboys-clad trucks, a Dallas fan’s devotion runs deep. (Not a bad quality in a prospective partner!) A bit of competition always makes things interesting. That sort of enthusiasm can be channeled into the perfect date. Here are a few ideas that are sure to score, whether you’re a sporty single or one-half of an adventurous duo. Mavs games are just plain fun. Go ahead. 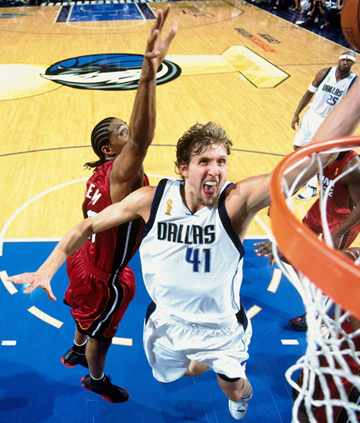 Spend an evening with Dirk. Even if your date isn’t that into basketball, or any sports, you can assure them that simply being part of such an insanely spirited crowd makes the whole experience satisfying. From the Mavs ManiAACs to the team’s creative and often hilarious videos, you can’t lose. Just be aware of ticket prices: Nosebleeds run around $20, but anything closer will most likely be a splurge. Either way, you can’t go wrong. A trip to a Stars game may land you and your date in the strike zone for the kiss cam. The arena–and game–is lively but also laidback enough to chat between plays without yelling. Also, with the aggression hockey is so often known for, chances are you’ll leave with something to talk about. Cheap tickets are pretty easy to come by if you lower your standards to the back rows, but it really depends on who’s playing. Texas is a football state. This we know. But take a different approach and head to Frisco for an FC Dallas match. This club’s fanbase is among the city’s most loyal and spirited. You two may even make a few new friends and be drawn into a post-game pub crawl. TopGolf doesn’t play around when it comes to friendly competition. With microchips tracking your every swing, it’d be hard to let someone win here. (Good sports only!) With $7, you get one game of 20 balls. Play a few games without breaking the bank. The venue caters to groups, meaning you could bring along some friends to turn your one-on-one date into a full-blown tournament. If you really want to score some points, take your date dancing. Not only will a dancing date break the ice, it will have you smiling from ear to ear regardless of your two left feet. Dallas has something for everyone, from two-stepping and swing dancing to EDM and salsa. Many venues offer free lessons for the more choreographed dances, so this is a great idea for anyone looking to woo their date without pinching pennies. If you thought you couldn’t play beach volleyball in the heart of Dallas, you thought wrong. Deep Ellum’s Sandbar Cantina and Grill lets you register teams of two, four, or six for weekend tournaments. They also host soccer, flag football, and even dodge-ball games. Triple date, anyone?